Over the years, people have asked me what I eat on a regular basis to remain healthy. I have tried to explain the wonderful food Sally prepares for us, and I have been unable to truly capture the essence of our meals. Sally has stepped in to help, and today, we introduce to you Sally’s Everyday Kitchen, pictures and recipes of meals created by Sally. When I am asked where is my favorite place to eat, my answer is simple: Sally’s kitchen. For those of you new to the blog, Sally is my wife, and she is the creator of magnificent, beautiful, healthy meals. In the past, Sally has gathered recipes and considered how she might be able to put together meal planning for people with Parkinson’s. Also, she considered doing a food blog to assist all of you. Recently, she came up with a great idea and immediately put it into practice. She has started taking pictures of the food she has prepared for our meals, and then she has been posting the pictures with the recipes. 1. You can click the link above and bookmark the page for easy reference. 2. If you are viewing my website on a computer or laptop, you can scroll down the page and look at the right-hand column of your screen. There you will find at the bottom a link to sallyseverydaykitchen on Instagram as well as the two most recent posts by Sally. 3. If you are viewing my website on an iPhone, iPad, Smartphone, or any other tablet or mobile device, you can install the Instagram app and search sallyseverydaykitchen, and that will take you to Sally’s Instagram page. Please note: If you wish to write comments on sallyseverydaykitchen, ask Sally questions, or click the button to “like” her posts, you will need to set up an Instagram account, which is free, and “follow” sallyseverydaykitchen. As you know, I was very fortunate to have Sally creating and preparing very healthy meals for me when I had Parkinson’s, and now she is sharing our meals with you. Of course, I am still very fortunate to have my meals prepared by Sally. 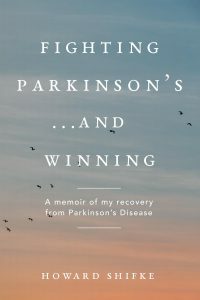 Sally, I am grateful that you have been my partner all of these years in supporting this wonderful worldwide community of people with Parkinson’s working on their recoveries. Thank you for sharing your love of healthy meals with all of us. I love you! Okay, everybody, take a look at sallyseverydaykitchen and you can begin to enjoy her healthy culinary creations for yourselves, too. Yippee – So important! We are inundated with unhealthy choices, sugar being a huge culprit. I am gluten free and even then the carbs in my diet are mostly organic vegetables. The difference between organic and not is the synthetic pesticides. Organic uses a natural one and does not get irradiated. Beets are a wonderful liver cleanser, but only organic! Also Blue/green algae from Klamath Lake, Oregon is chocked full of wonderful minerals from lava flows. That is how Mother Earth restores the land. I bought mine from Power Organics. Thanks for sharing, Howard and Sally. Sally is a fabulous cook. Everything is so healthy and fresh. She sent me a recipe called cardamom porridge, which defines comfort food. I think Howard must have recovered as soon as he did due in part to the good food he was given and the love that went into it. Oh how lovely thank you! Can’t wait to have a look! Thanks for sharing your love and positive energy Sally. The pictures and recipes are beautiful. Thank you very much dear Sally!! Great idea and work👍 You both, Sally and Howard, are a wonderful team!! What a lovely idea Sally! Also a big thank you for all you do in supporting Howard to help us . Hi all, behind every successful man is a great woman, so I would like to wish that great woman every success on her new venture. Sally the recipes are wonderful and the pictures look fabulous ! All I need now is someone to cook them for me lol. Howard was and is so blessed to have you nuturing his body with the right foods. May your reward be great as you share your passion with others. The photographs make us hungry. Linda and I are looking forward to trying the recipes. Yes, you’ve done it again Howard and Sally: yet another way for us all to express our sharing and caring that builds up the positive emotions so important to our recovery and human health in general. Your encouragement and enthusiasm means a great deal to me. I look forward to sharing our meals on Instagram so that it will inspire you to try some of these recipes. If you ever make your way to Portland, Oregon, we would be delighted to have you join us at our table. I would love to cook for you!